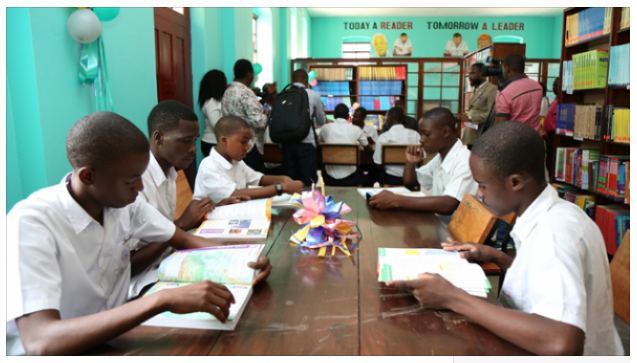 Sahara Group, an African energy conglomerate, has renovated the library at Pugu secondary school in Tanzania, opening a new world of learning and development for over 900 students and 76 teachers of the institution. The school, which has a celebrated heritage of producing presidents and notable Tanzanians, hitherto experienced a lull in its reading culture due to the dilapidated library. The project was carried out by Sahara Tanzania, Sahara Group’s subsidiary, in conjunction with Sahara Foundation and READ International, a non-government organisation. While speaking at the inauguration of the library in Dar es Salam, Bethel Obioma, head, corporate communications, Sahara Group, said the organisation was delighted to be given the opportunity to empower youths in Tanzania. “In addition to renovating the library and refreshing its ambience, Sahara also donated new books which we believe will inspire the students to pursue their dreams and aspirations with renewed vigour. At Sahara, we are passionate about providing platforms that transform lives,” Obioma said. Nicolas James Buretta, acting commissioner for education, ministry of education, science and technology, said he was confident it would “improve access and equity in education for the current and future students of Pugu Secondary School”. “Sahara’s gesture resonates with the resolve of the Tanzanian government to sustainably improve access to quality education. Juvenus Mutabuzi, headmaster of Pugu, described the library project as “a new dawn” for the school, saying it had paved the way for Pugu to reinforce its position as a leading institution of learning in Tanzania. Babatomiwa Adesida, manager of Sahara Foundation, said Sahara was also exploring the introduction of its extrapreneurship framework in Tanzania to provide a platform that finds, creates and connects young entrepreneurs in emerging markets. “We will embark on projects that expose and connect young business owners to boundless growth opportunities.